Over the past ten years we have sold almost every model of Danish bed imported into the States and this exquisite model from Bernard Pederson & Son is one of the finest and rarest we have come across. The refined details of this bed combined with its solid construction methods make this bed a unique stand out. We have priced this piece a little higher than some of the more common beds but it’s higher quality, exceptional condition, additional features and superior construction make it worthy of it’s price. The integrated nightstands feature a sliding Tambour door storage area, dovetail drawer with sculptured Teak pull, sliding glass covered tray (see photos) and an open storage space below. These are well designed and very practical nightstands. The quality of this item can be seen in the construction and materials used. This is not your standard Teak box Danish bed – look at the photos of the corners and headboard details. This is simply a better product than some of the other floating beds you may find on eBay. The overall condition of the vintage Teak is exceptional with little sign of wear. Nice solid construction and graceful modern design by a top-notch company! 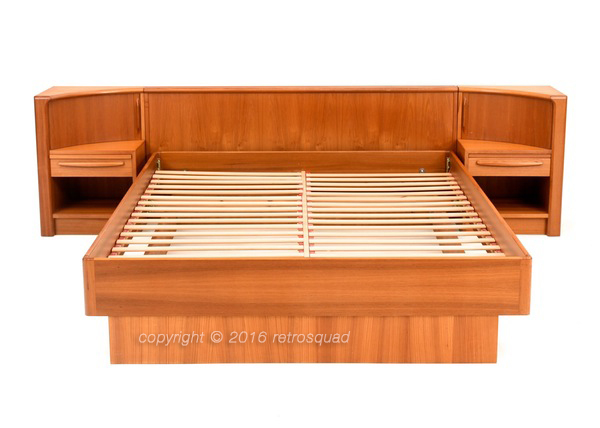 This entry was posted in Bed, Bernhard Pedersen & Son, Furniture, Manufacturers and tagged Danish Modern, Floating Bed, Teak by RetroSquad. Bookmark the permalink.